Sketch My Event? 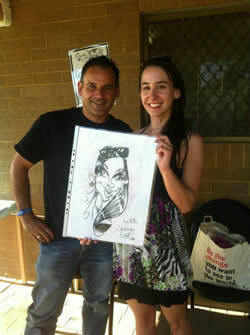 Rick Adams is Perth Best Caricature Artist in Western Australia. I can sketch people, dogs, cats, cars from variety of photographs and transforms you into a fun themed caricature of your friends & family. 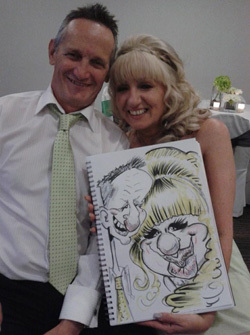 Rick is known best at live Wedding events, sketching live caricatures of your guests. I do corporate events, Weddings, Hen parties, Dog shows, fund raising events, Christmas Parties and Graffiti Murals seen in East Butler Primary and Perth Airport and Wembly Arena Bowling Cafe. Rick was chosen to create Jane seymore in caricature for Mad Publications books in the USA- "James Bond caricature book" and a tribute to Robin williams in caricature. 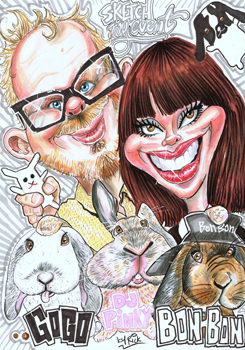 All my caricatures are tradionally hand drawn and no digital App effects. I work by sketching shapes to create ones caricature face and then creating a unique themed caricature with branded imported marker pens & pencil to sketch your artwork. If you need Gift Caricature done, contact Rick by email and he will get back to you to download your photograph and have it characterized. My sizes are A4 B/W $50, Colour $80, A3 B/W $100, Colour $150 and Now A2 Size B/W $250 or Colour $350. I can Theme your Caricature with any of the above prices. Looking for some think different as a gift! I can sketch and paint Babushka Dolls by Illustrating a portrait / caricature onto these nesting dolls, seen on my gallery page. Sketch My Event ! For the First 3 Hours at a Rate of $150 per hour for Traditional Caricature Art, which is the CHEAPEST Rate in Perth WA for all Events. Book your Wedding or any other event by emailing me for availability for your special event. 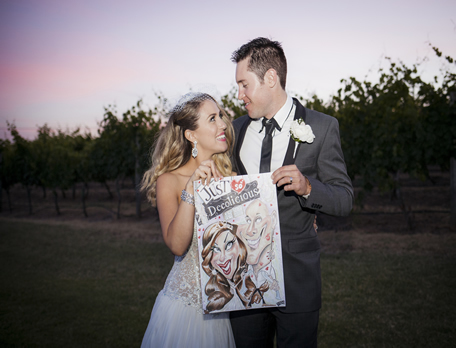 If you require a detail wedding Caricature of you both in wedding attire this is Discounted to $125 dollars to create in colour or $80 dollars in Black & White on A3 Paper. Event sketches usually takes up to 5 - 10 minutes per person/couples drawn on A3 sized paper. I estimate up to 20 - 30 head caricatures or more within the three hours on the A3 paper. I can work up to 6 hours non- stop caricaturing your guests at a discount rate of $100 AUD Per hour for extra drawing time per hourly rate.If you do have a event, please contact Rick for availability by email or on facebook. If you need a Caricature done Online, visit my contact page and email or facebook/Sketch My Event. 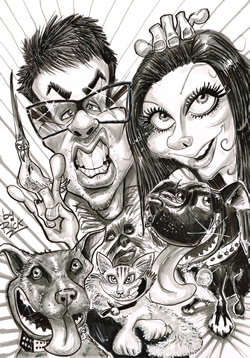 I do get busy with online caricatures and will start as soon as possible on your caricature art. Copyright 2012 SketchMyEvent, All Rights Reserved.